Many challenges face organizations as they describe their business domains from a services perspective and transform that understanding of their business into a specific realization targeting a solution infrastructure. However, one of the most pressing problems involves helping organizations to effectively transition to service-oriented design of applications. Great benefit could be gained by using a well-defined, repeatable approach to the modeling of business domains from a services perspective that supports the application of automated approaches to realize a service-based solution. 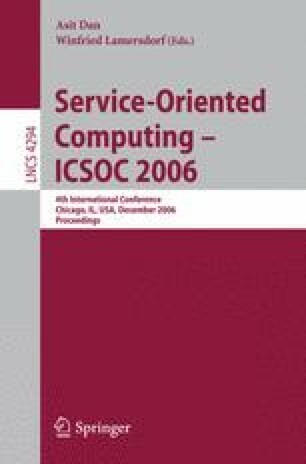 In this paper we explore model-driven approaches to the realization of service-oriented solutions. We describe a services-oriented design approach that utilizes a UML profile for software services as the design notation for expressing the design of a services-oriented solution. We describe how a services model expressed in this UML profile can be transformed into a specific service implementation, and describe the design-to-implementation mapping. We then comment on how these technology elements play in an overall MDD approach for SOA.